September 16, 2015 — I don’t know when it first happened, but these days Halloween starts to bloom in August. At grocery stores, flip-flops slap down aisles lined with Halloween candy. At home and craft stores, fresh sunburns get rubbed in the glowing lights of Halloween decorations. Candle stores overpower the scents of sunscreened visitors with Halloween parties thrown in August. Honestly, I don’t like it, but I’ve had to give in somewhat, checking out Halloween wares in a full, dirty, summer sweat. Partly that’s because my own glass house is built in September, but also to avoid new items disappearing before I get around to checking them out. But I now have an exception to this discomfort. 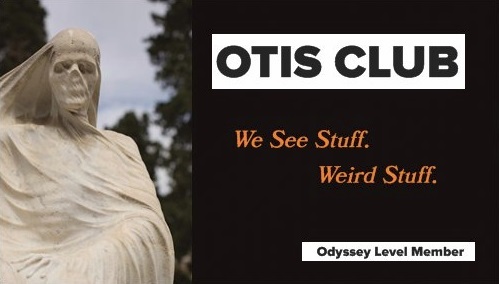 Something that seems to be both a legitimate August experience and a legitimate Halloween one. See, this August something came in the mail for me. Like mail as in actual dead trees stuffed into an archaic little plastic box nailed to my porch. I opened the mailbox lid, cringing first at the scream of hinges rarely used and then again at the generations of spider webs I had to reach through to pull it out. 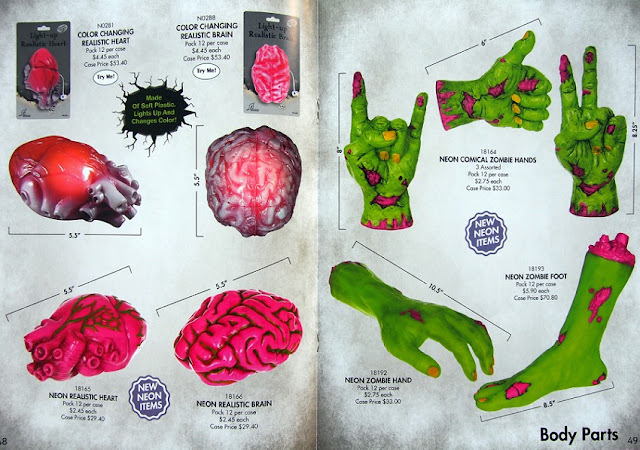 But there, right there, I was delighted to find…a Halloween catalog. 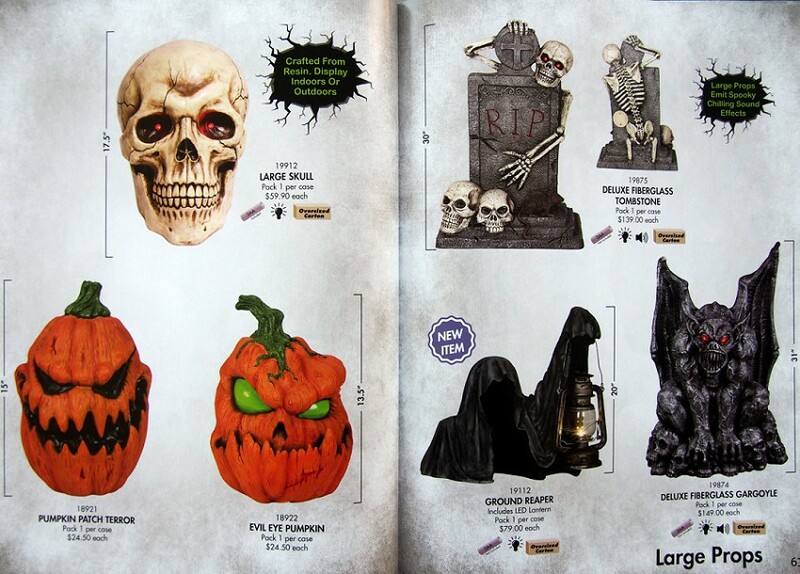 An honest-to-Samhain Halloween catalog. 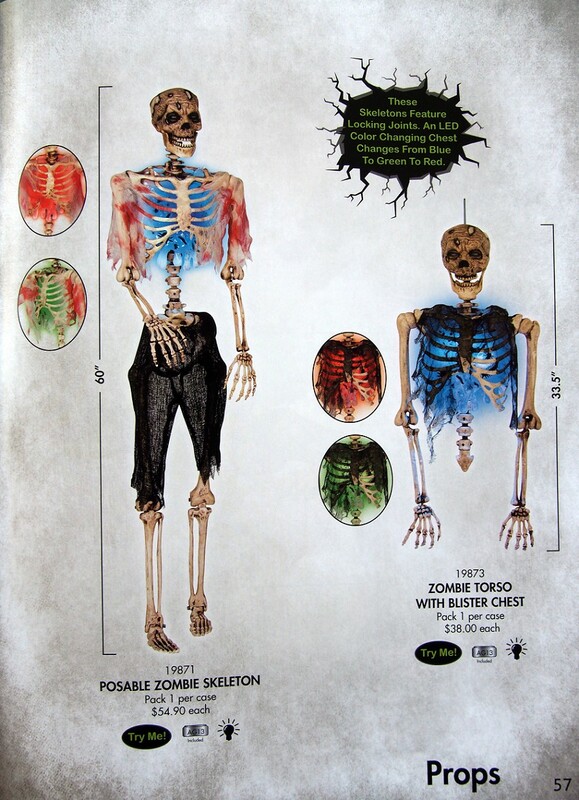 This, this, this is the perfect way to whet your interest for Halloween in August without getting soaked too soon. 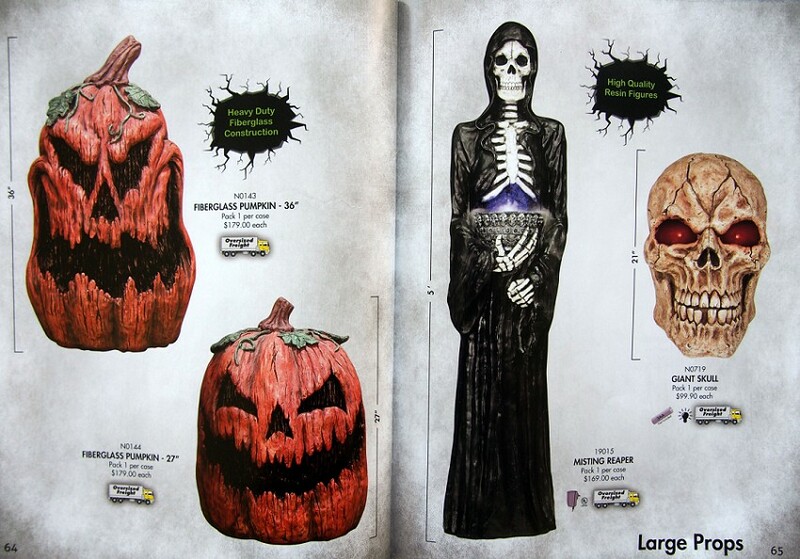 It’s the Seasons USA Inc. 2015 Halloween catalog, 96 pages of glorious Halloween decorations and costumes printed on glossy saddle-stitched paper. 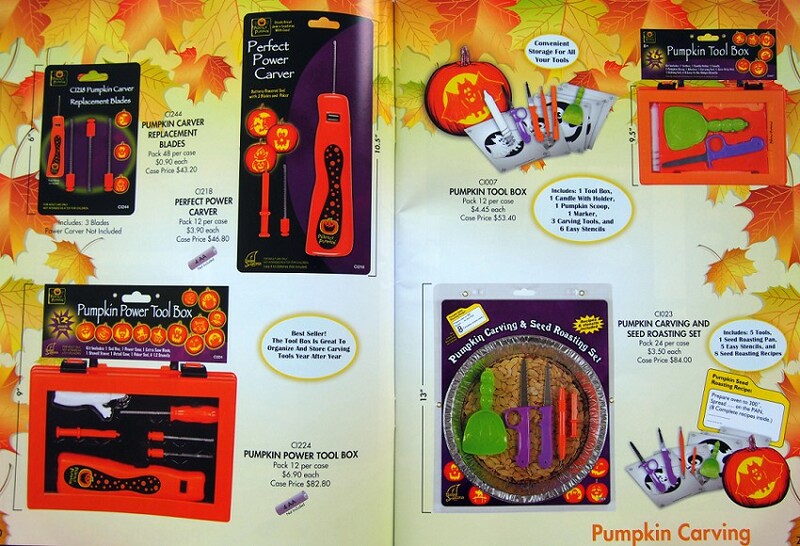 Now, what makes this catalog special is that it’s a wholesale catalog. It’s meant for stores to use to buy products in bulk to then sell individually at a margin-adjusted price. It's not meant for us mere consumers. Why I’m getting it is most certainly because of this bony business, not because it’s always been my fantasy to run a year-round Halloween store. Although it is. 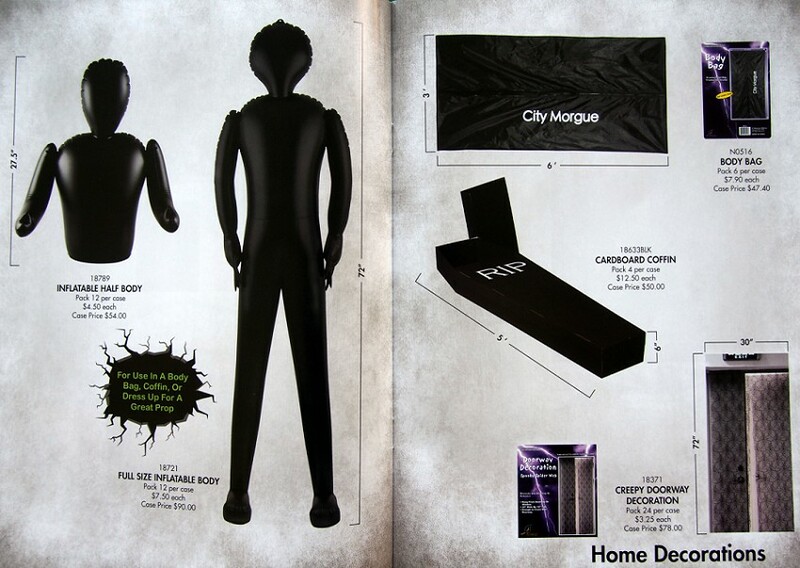 Also, what makes this catalog special is that it’s completely unnecessary. Technically. The company has a fully stocked website. But all it takes is comparing those screens of digital ephemera to these photos of actual pages from the catalog to completely get why they would do this and where the August Halloween magic really resides. So assuming that most of you didn’t get one of these yourselves, I’m going to tour you through some of my favorite pages. Watch out for paper cuts. First, just scroll back up and look at that cover. Could it be any more glorious? I’ve been squeaking my fingers across it for weeks. Digital Halloween just can’t compete. 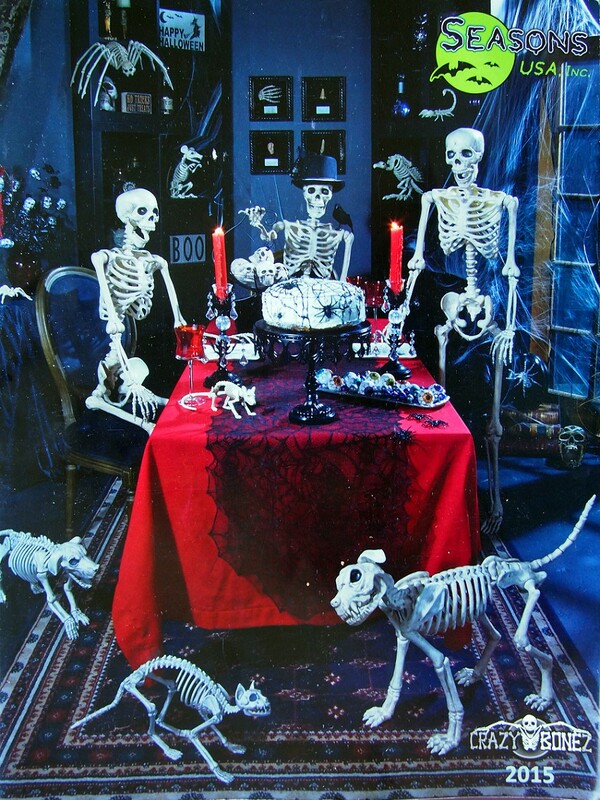 I have the feeling this is how Halloween will look for a very long time. Life in general, in fact. And while I'm not totally opposed to pop culturing up my Halloween decorations, we could probably try a little harder than this, right? 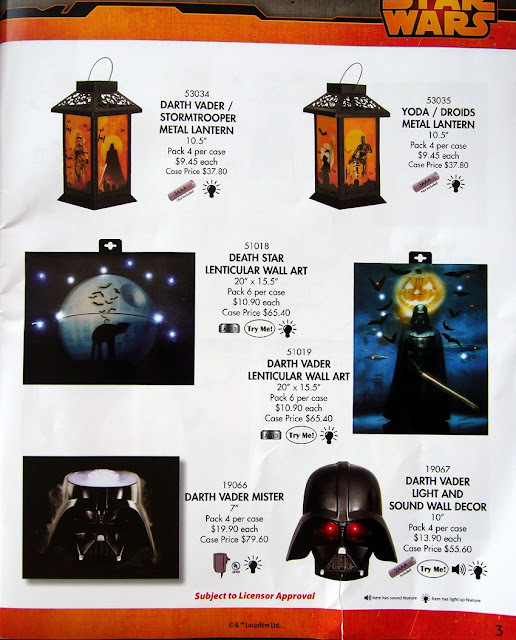 I mean, if jack-o-lanterns and Darth Vader are going to inhabit the same universe, they should do so inextricably. Cleverly. Like you could yank the Dark Father off that "wall art" and put anybody from Freddy Krueger to Withnail on it and it wouldn't change the poster substantially. Same with those lanterns. Making C3PO orange isn't enough to call it a long time ago in a Halloween far, far away for me. There were more pages of this Star Wars Halloween Special, but it was pretty much all the same. Plenty of both peanut butter and chocolate without the craft of making it a Reese's Cup. It's the Halloween Season. Expect a lot of candy metaphors. Now this makes me happy. We're to the point in our cultural Halloween evolution where we can set a Thanksgiving table completely with Pumpkin Master utensils. At the very least, I'll one day have a dedicated pumpkin utensil drawer in my kitchen. All right. This is kind of interesting. Get rid of the playful orange, and stick with the basic black. I want to try a Halloween themed this way and see how it goes. I love the 1980s pink and green body parts too much, but mostly I included this page for the oxymoron, "color changing realistic brain." I'd be hard-pressed to name my favorite things in the book, but these might be it. 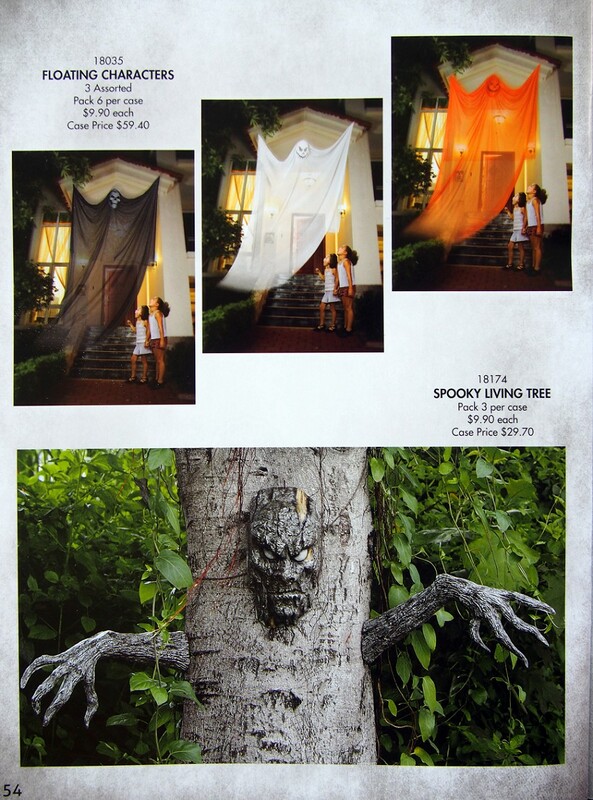 Giant entryway-covering ghouls and tree monsters. I wish I had a giant entryway and trees on my property. I used to be of the firm philosophical stance that it's impossible to improve on the classic skeleton. I might now have to rethink that. The previous three pages pretty much represent Halloween as I want it to be. Surround me with items like these and I can take on the world. So the straps on the righthand page are pretty cool, no doubt. But I included this page because of the devil-on-my-back props on the bottom half of the lefthand page. They...just...seem...right. And important somehow. I would wear these like suit jackets to work. 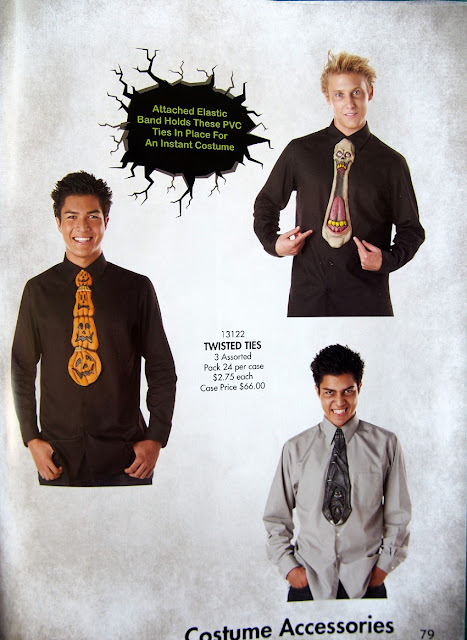 And speaking of work, owning these ties would make me look forward to my next client meeting. Even if it's not until December. So that's what I got. Almost 100 pages of awesome Halloween, and I turned it into 900 words of less than questionable worth. 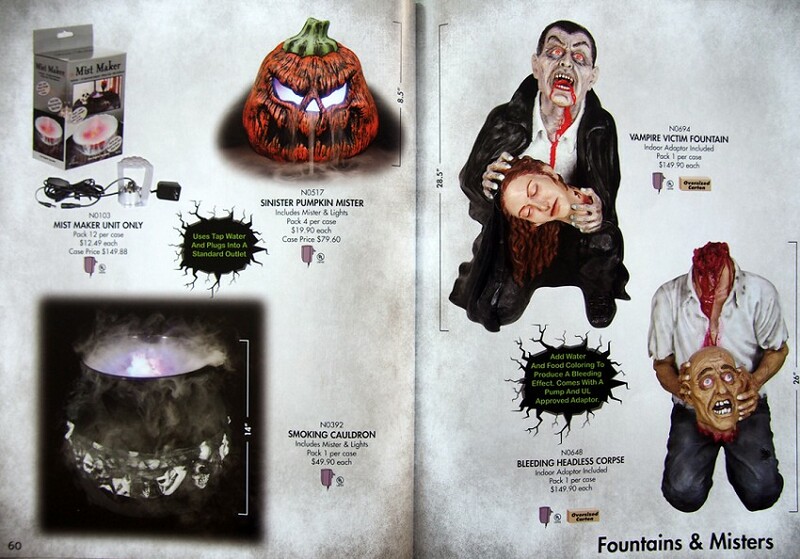 Maybe you’ll see some of these items in stores near you, if there's anything Halloween left by this time.